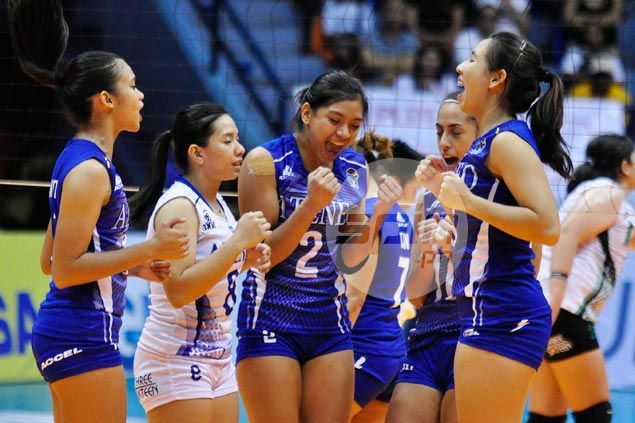 ALYSSA Valdez carried the scoring load as expected as undermanned Ateneo recovered from two sets down to beat College of St. Benilde, 23-25, 18-25, 25-8, 25-20, 15-10, on Saturday to remain unscathed in the V-League Collegiate Conference at The Arena in San Juan. It was the fourth win in as many matches for the Lady Eagles, with Valdez scoring a conference-high 32 points from 26 spikes, one block and five service aces. “Medyo affected kami kasi ang dami na ng injuries sa team pero at the end of the day nandyan si coach Tai (Bundit) and ’yung team work talaga gumana,” said Valdez. Bea de Leon gave herself an early present before turning 19 on Monday, scoring 11 to help lift Ateneo, which is without the injured Jia Morado (knee), rookie Kat Tolentino (right knee ACL), Mae Tajima (sprain) and Therese Gaston (left shin). St. Benilde got to within two points, 7-9, in the fifth set but service errors by the Lady Blazers gave the Lady Eagles a 12-9 lead. CSB’s Jannine Navarro had two consecutive shots sail out, handing Ateneo the victory after battling for two hours and four minutes. The Lady Blazers, who started the tournament with back-to-back wins, have now suffered two consecutive five-set losses, earlier bowing to University of Santo Tomas. Jeanette Panaga scored 17 points for the Lady Blazers, while Navarro had 14.